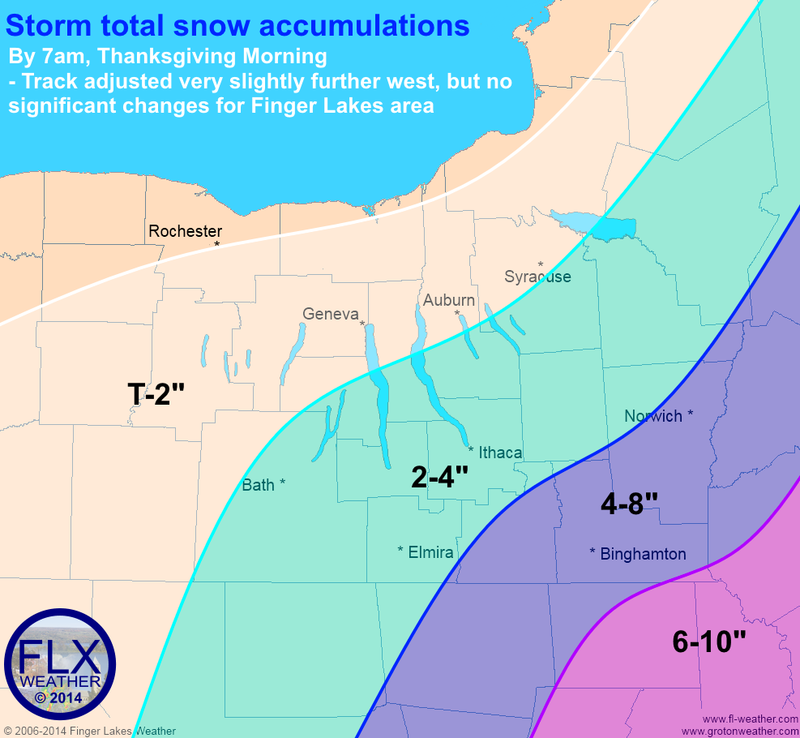 Expected snow totals over the Finger Lakes region by Thursday morning. These totals are very similar to amounts predicted yesterday. Click image to enlarge. – Washington DC to NYC: I had predicted a belt of 8-16″ running from the Virginia mountains to just north of NYC. I think this was probably overdone as the precipitation in these areas this morning is mostly rain. That narrow ribbon of 8-16″ will probably end up more like 3-6″, with the higher elevations pushing towards 8″ or 9″. 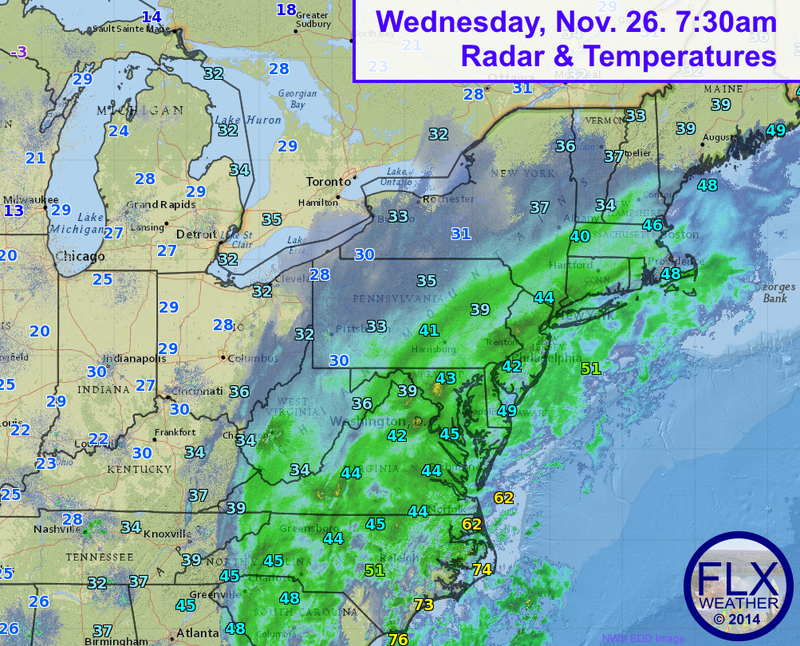 Wednesday 7:30 am radar shows a large storm system spanning across the east coast. Much of the precipitation early on is rain, but will change to snow as the day goes on. Click image to enlarge. – Northeast PA & the Catskills: Most of this region I had in the 4-8″ zone. The storm is jogging a little further west than I forecast, so these areas are more like 6-10″. I was already further west than most other forecasts, so my changes are slight where as others seem to be making a big deal of the westward jog this morning- keep in mind that my forecast isn’t changing very much so you shouldn’t have to adjust your plans too much. 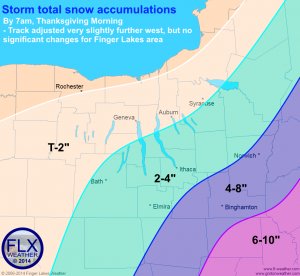 – Finger Lakes: I didn’t really make any significant changes to our region except to move the 4-8″ line a bit closer. Again, you shouldn’t have to change plans much if traveling around our area and the storm will still mostly be a small factor in our travel. The peak of our storm will be this afternoon, but it should more or less end this evening. Some scattered snow showers are likely into Friday behind this system.